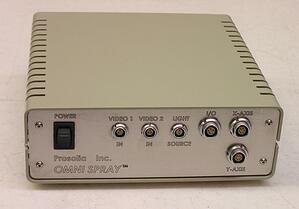 Custom designed control box for medical/research lab device. Precision motion control and vision integration. Control box designed for technology startup to provide motion control and vision system integration for mass spectrometer technology system. Project included custom electrical design, schematic capture, packaging design, custom embedded firmware, prototype development, and turnkey production. Device is now provided to the customer as a turnkey manufactured item, and is shipped with their system as part of their final product.